Not being a big fan of novellas, this one wasn't bad. It moved along rather quickly, the story line is one that is talked about in the news and for us that live in the so-called western world, a story that is very hard to comprehend let alone condone!A young girl of Afghan descent has been basically thrown out with the trash, but not before being mutilated/disfigured for bringing "shame" to her family - utter BS.It takes some read forensic work and detective skills to get to the bottom of this horrendous crime. Once again Leigh Abbott and Matt Lowell team up along with Matt's graduate students to help identify the remains and solve the crime.A great read all-in-all - highly recommend this series. If, like me, you feel the time between 'Dead Without a Stone to Tell It' and 'A Flame in the Wind of Death' is far too long then I recommend you give the e-novella by Jen Danna and Ann Vanderlaan 'No One Sees Me 'Til I Fall' a read.Only weeks after Trooper Leigh Abbott and forensic anthropologist Matt Lowell (and his merry band of students) finished 'Dead' they are assigned a new case that will leave the team and the reader haunted by an epidemic that is taking place the world over but that few speak of or even know of. A young girl is tossed into the local dump in the dead of night and the perpetrator is counting on her disappearing forever. But Abbott and Lowell are determined to give her a name, a face and the justice she deserves.Matt's past in Afghanistan comes back to haunt him with this case. But on a more positive note, we are treated to some glimpses into the blossoming romance between Lowell and Abbott.And even better - we get the first chapters of 'A Flame in the Wind of Death' to whet our appetite and to show that Danna and Vanderlaan have no intention of slowing down with this series! .The book grabs your attention right from the beginning . The detail was gut wrenching and makes shows how cruel humans can be. Excellent read had to read straight through . Teamwork to solve the Murder mysteryLeigh and Matt team up again when police revive a tip that a body is in the local landfill dump. They need the archeological team to discover how the Vic I'm lived and died. Fun chemistry between Leigh and Matt. The e-book novella between full length books in a series is becoming a popular device for authors to keep readers involved with the series' characters and these novellas can be used to present a new story (in this case mystery), or to expand upon an event that happens or a character mentioned in one of the longer stories. Jen J. Danna and Ann Vanderlaan have used this e-book to give the reader another adventure, albeit shorter, with the fascinating characters they've created. The new story novella serves to move the characters along and reveal more about them. No One Sees Me 'Til I Fall gives fans of the newly minted series a satisfying length of a story where the progression of the characters and supporting characters is played out in a thrilling new case of forensic identification and smart police work. Trooper Leigh Abbott of the Massachusetts State Police and Dr. Matt Lowell, forensic anthropologist, must combine their skills for a second time to solve a baffling murder.In this second tale of gruesome murder, Leigh consults Matt about a just discovered quickly decomposing body that has been dumped in a landfill. The body's enclosure in a garbage bag and being heated up by the garbage pile beneath it has resulted in major loss of tissue, so Matt and his graduate students team are needed to piece together a human being from the bones beneath. The news that the body belongs to a female from age 18 to 23 is not a surprise, but the uncovering by Matt of a heinous abuse stuns everyone involved in the case. Determined not to let the monster who abused and most likely also murdered this young woman escape justice, Leigh and Matt pool their resources and skills and those of Matt's enthusiastic grad students. Matt will unfortunately have to relive some painful war memories to aid the search for the killer, but his unique experiences are key. Leigh and Matt will find their personal relationship gaining ground along with their smooth working partnership as the evidence unfolds. Jen Danna magically weaves words to enable the reader to feel the intensity of the investigation in this story and feel a part of the action. At times, I felt as if I were sitting at the table discussing the leads with the pair or running alongside in a chase. Engagement is fully achieved. One of the lines from the story expresses Leigh's admiration for the forensics involved in helping to give a face to the faceless victim, the words describing it as "marvelling at the skill that brought bone to life." This series is so impressive in its detailed accounting of that forensics and the amazing results. I can hardly wait to read the next book to learn more about how science and detective work take the impossible to the solvable. Having just finished ‘Dead, Without a Stone to Tell It’, the debut novel for writing team Danna and Vanderlaan, I was impatient to read their next just-published work, ‘No One Sees Me 'Til I Fall’ and I downloaded it almost immediately. Leigh Abbott and Matt Lowell are already firmly entrenched in my consciousness as characters with depth and appeal, and I was eager to see where these two clever authors would go with them next.I was catapulted back into their world from the first page; a body is dumped at a land fill, discarded with as little thought as were the piles of garbage that surround it. Abbott, Leigh and their team of grad student techs work together to identify the victim and through that collaboration discover a culture of cruelty that can be difficult for us to comprehend. A culture where woman have little value and horrendous practices against them are accepted. In giving the victim back her identity and uncovering the perpetrator of this debasing crime, they give her back her dignity and humanity. The journey there is fast paced and packed with drama and tension.Published as an e-novella, this story reads like a full length novel and has just as much impact. It is thoughtfully crafted and rich with detail, an unexpected and satisfying accomplishment in a work of this length. You can read this as a stand alone, but don’t stop there. Personally, I am champing at the bit to read the next full length instalment! NO ONE SEES ME 'TIL I FALL is a novella that was written on a whim by the authors to provide a story for their fans to read while they complete their next novel. I think it's great that these two authors have considered the feelings and needs of their fans, and wish that more authors would do this!The focus of NO ONE SEES ME 'TIL I FALL is the solving of a particular case, a case in which the dead body of a beautiful young girl is found in a landfill. The state trooper, Leigh Abbott, once again partners with forensic anthropologist, Matt Lowell and his graduate team to uncover clues that eventually lead to the capture of the murderer. What I really like about this book is that it is relevant to today's reader who lives in a post 9/11 world. As the characters find the culprits of this crime, they educate the reader with facts about the Taliban and their customs. Well-researched, and told, this tale is sure to fascinate you from the get-go, and will leave you wanting more of what these two authors offer. Although I must, I don't want to wait for their next novel, A FLAME IN THE WIND OF DEATH, which will be released in about six month's time. After the first book in this series, I saw such promise that I purchased the second book on Amazon. What a bust. Nowhere near as good as the first. Really disappointing.I am now reading the 3rd book in this series and don't understand why the end of the second book was the first part of the third book. I have read many other series where they may have the first chapter of the next book at the end, but it states that point and gives the name of the new book. Maybe because it was a Kindle book and they didn't show that it was part of the next book. Sometimes Kindle books leave a lot to be desired, especially the spelling. Too much spell check and too few actual readers to check the book before it is published. No One Sees Me 'Til I Fall is the second book in a fantastic new series by Danna and Vanderlaan. If you like well paced detective fiction, fully thought out and properly researched (no made up places or scientific facts), this is a work for you. Trooper Abbott and Dr. Lowell are just beginning their voyage solving crimes, but already the seeds are sown for success - both professionally and personally. Not only are the leads well developed, but the secondary characters are made real as well. The cases are complex and very real. There are no missing "clues", it's all there, IF you have the insights of Abbott and Lowell to find them. I would highly recommend this book to anyone, whether you like detective fiction or not. Yes, it's that good. 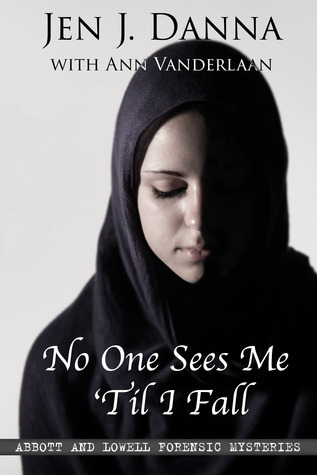 No One Sees Me 'Til I Fall is a brilliant forensic anthropology novella. The second in the Abbott and Lowell Forensic Mysteries, it is a page turner, and was over far too soon for my preference, though I'm glad to have something to tide me over till A Flame in the Wind of Death comes out in May. The characters are well written, not only Abbott and Lowell, the team of graduate students, as well as the victim and the suspects. As with the first book in this series, Dead Without a Stone to Tell It, it is very clear that the background of the case and the technical details were well researched, making No One Sees Me 'Til I Fall, a wonderful, if heartrending read, because of the realism of the case. I can't wait for the next novel! I read this in one sitting - taking me only around an hour - as I couldn't actually put it down. It was just as good as Jen J Danna's first book, although a mini version as it's a novella rather than a novel. Still, it had all the same components - enjoyable storyline, forensic explanations and good characters. Having only just read the first book, it felt like a natural follow on, which is why I prefer to read a series of books (especially crime or thrillers) back to back until I run out of the books to read. This time the crime had a cultural theme, which was interesting in itself, although a sad background story. These books seem to be very well researched as well, which is probably what makes them so appealing. This Novella, the second in the Lowell and Abbott forensic mystery series was short and sweet. The second in the series finds Leigh and Matt in the beginning of their relationship, and investigating the murder of a young Afghan immigrant. The shocking differences in how some cultures treat women is explored at length. The forensic details are meticulously researched, and descriptive without being overly disturbing. A great second in the series to keep us wanting more. I'm looking forward to book 3! This novella showed the utmost cruelty that women in other cultures must endure. It is horrid to think the a young woman's father could do those things to her and get away with it in their own country. I found this rather disturbing. Also starting each chapter with a dictionary lesson was a bit much. Loved this novella by my pal Jen J. Danna. So well done! The murder mystery was both heartbreaking and engaging. And I love the chemistry between Abbott and Lowell. Can't wait for the next in the series! I seldom, if ever, give 4 stars to short stories/novellas. This one deserves it. Excellent. Jen J. Danna Ann Vanderlaan - A scientist specializing in infectious diseases, Jen works as part of a dynamic research group at a cutting-edge Canadian university. However, her true passion lies in indulging her love of the mysterious and thrilling through her writing. With her partner Ann Vanderlaan, Jen writes two series: the Abbott and Lowell Forensic Mysteries—suspenseful mysteries with a smart, scientific edge, and the FBI K-9 Mysteries—a new thriller series under the pseudonym Sara Driscoll starring FBI K-9 handler Meg Jennings and her search-and-rescue black lab Hawk.Abbott and Lowell Forensic Mysteries include: DEAD, WITHOUT A STONE TO TELL IT; NO ONE SEES ME 'TIL I FALL; A FLAME IN THE WIND OF DEATH; TWO PARTS BLOODY MURDER; LAMENT THE COMMON BONES - coming in 2017.FBI K-9 Mysteries: LONE WOLF, coming November 29, 2016. Book 2 - coming 2017. Book 3 - coming 2018.